Local online retail goes mainstream and is set to pass the R14-billion mark this year, marking 1.4% of total retail. Online retail in South Africa is due to pass the R14-billion mark in 2018 as ecommerce begins to go mainstream. This is a key finding of the Online Retail in South Africa 2019 study, conducted by World Wide Worx with the support of Visa and Platinum Seed. Online Retail in South Africa 2019 is endorsed by the Ecommerce Forum of Africa. Heavy Chef is the learning partner for this initiative, which seeks to actively promote online shopping and the growth of online retail in SA. Forecasts have been beaten as a result of massive investments in online retail, aggressive marketing, and the rapid uptake of new shopping channels like mobile shopping and Instagram. Further, most established online retailers have enhanced their digital presence, and refined their fulfilment models, while many traditional retailers are starting to see significant growth in their online offerings. It is not unusual to see growth rates of between 25% and 50% reported by individual online retailers, with slightly more tempered expectations for 2019 and 2020. The result is that growth accelerated in both 2017 and 2018, and only a small dip in the rate of growth can be expected in 2019 and 2020. Online retail is projected to reach 1.4% of total retail in South Africa, based on an estimated R1-trillion to be spent via traditional channels in 2018. The 2% mark is likely to be reached by 2022. 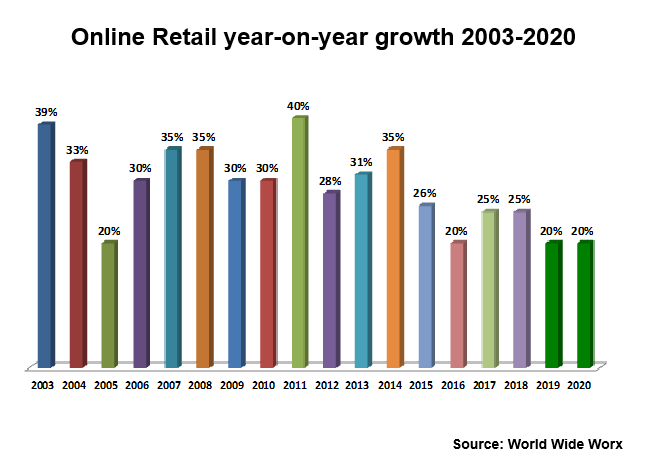 The forecasts by World Wide Worx for the next three years, from 2018 to 2020, show online retail sales more than doubling from 2016, to almost R20-billion, a year sooner than originally forecast in 2016. Online retailers in South Africa still make up a small proportion of overall retail, but for the first time we see the promise of a broader range of businesses in terms of category, size, turnover and employee numbers. This is a sign that our local market is beginning to mature. 75 companies with an online retail store or market participated in an industry survey as part of the project, providing a representative sample of the local overall online retailer population. In total, the survey of South African retailers yielded over 6000 data points for analysis. Apparel remains the fastest growing sector in Online Retail in South Africa 2019, but is also the sector with the highest turnover of businesses. Apparel illustrates the perils of a low barrier to entry: the survival rate of online stores in this sector is probably directly proportionate to the ease of setting up an online apparel store. The highest number of respondents was in the Apparel category, with 23% of the sample in this category. The second largest number of respondents fell into the ‘General’ category, at 10.8% — this includes sites like Loot, which sells across sectors. The third largest numbers of respondents are found in four categories — 8.1% fall into each of the following: Arts & Crafts/Decor; Alcohol, Tobacco & Vaping; Food, Groceries, Non-alcoholic Beverages & Gourmet Food; Home & Garden. Unsurprisingly, a fast-growing category is alcohol, tobacco and vaping. The increased online supply of vapes, juices and accessories suggest that the SA smoking bans, and the change in the legal status of marijuana during the survey, may have boosted consumption. A significant impediment to the growth of ecommerce in South Africa is the unwillingness of business to reinvest. Only one in five companies surveyed invested more than 20% of their online turnover back into their online store. Over half invested less than 10% back. This despite a high 71% of all online retailers surveyed, who say they are profitable. However, profits in ecommerce are no definite indicator of long-term sustainability. Young online retailers who do not reinvest in the underpinnings of their business may be sacrificing short-term financial gain for long-term survival. The single most critical factor in the success of online retail activities, as reflected in this survey, is customer service. No less than 75% of respondents regarded it as highly significant, with another 23% seeing it as somewhat important, giving it a 98% importance rating. This positions customer service as the sine qua non – that without which the rest is not possible – of online retail. Moving from SA to the global stage, customer centricity is the raison d’être that explains the most populous country in the world taking the lion’s share of all online retail ecommerce. The People’s Republic of China, with its population of some 1.404 billion people, achieved retail sales of $5.8 trillion in 2017. Online shopping accounted for 19.6% of this total. The next decade will see a shift from West to East, as the US share of the global ecommerce market decreases from 22.2% to 16.9% in 2020. China will rise, and rise, alongside India and other eastern countries, which will grow growing significantly, and with speed. Scale is a massive driver for the East, but there’s a strategic advantage that’s just as important to the region’s growth. The big difference between China and the US? China isn’t debating ecommerce, but has embraced a model ideated by Alibaba’s Jack Ma, called the ‘New Retail’. This is a human-centred logic that puts what’s best for customers at the epicentre of a massive push to enable ecommerce players, with the understanding that doing this will grow China. Making the customer your central obsession, and embracing collaboration over competition is what’s winning massive market share for Alibaba, China, its collaborators and retailers following these new rules. Moreso, it is driving growth for Asia. It turns out that by striving to make online retail better for people, Ma has created a broader movement that is advancing China’s economy, and that is rippling through online retail’s new world. Africa and South Africa have close ties with China, so it comes as no surprise that online retailers, like Jumia, have taken a leaf out of Ma’s ‘New Retail’ playbook. Like Alibaba, Jumia turns its operational problems into strategic benefit through innovation. The future will belong to those retailers whose strategy is directed by customer centricity, who learn from other’s mistakes, who transform operational weaknesses into strategic strengths through innovation, and who regard people as more important than product. The lack of reinvestment by online retail in the digital underpinnings of their business is a hindrance to growth. * For more information on findings, contents list and ordering information, download the executive summary by clicking here.